For years, people thought Sidney Strickland was barking up the wrong tree. He wasn’t. Sidney Strickland knew what he was up against when he began working on the disease more than two decades ago, and little has changed: Alzheimer’s remains a deadly health threat and among the most feared diseases on the planet, unchecked in its power to destroy brain cells and erase minds. What role, Strickland wanted to know, do impairments in the brain’s blood supply play in Alzheimer’s? At the time, Strickland, now a Rockefeller scientist and head of the Patricia and John Rosenwald Laboratory of Neurobiology and Genetics, was working on problems related to the circulatory system at the State University of New York at Stony Brook. 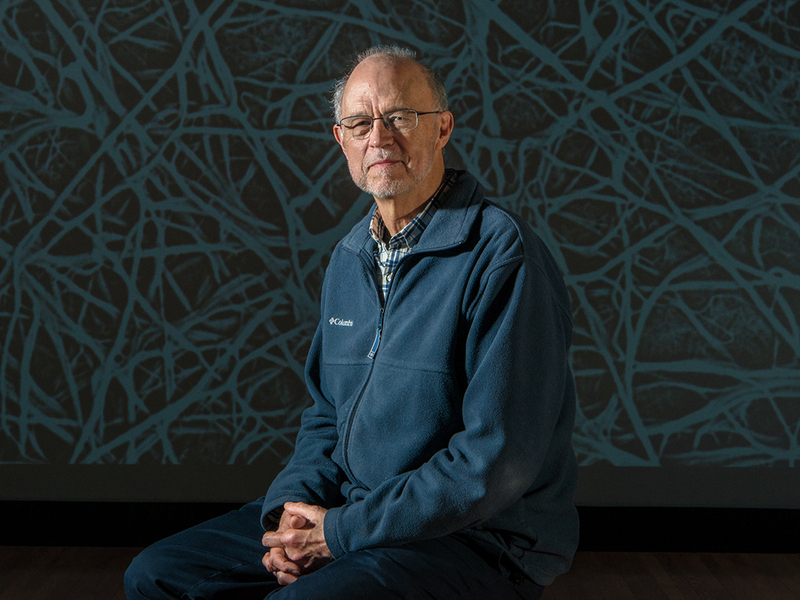 Sidney Strickland has found that fibrinogen can “leak” into the brain, causing mesh-like structures to form. Photograph by Sari Goodfriendlab. Exactly how fibrinogen seeps into the brain is something of a mystery. To get there, the protein needs to cross the blood-brain barrier, the brain’s primary defense system. 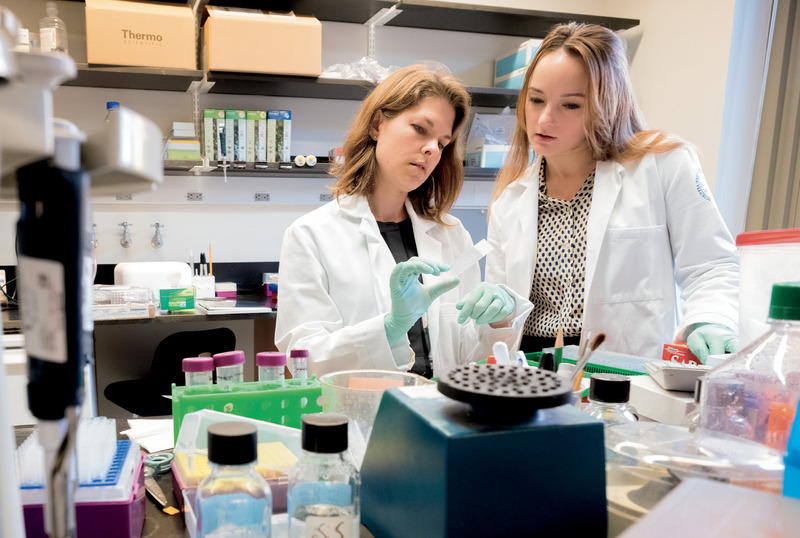 “The blood-brain barrier is made up of several different types of cells,” says Erin Norris, research assistant professor in the lab. “Presumably, something goes wrong in some aging brains, and these cellular components of the blood vessel wall start to break apart.” The rupture allows fibrinogen to gain access to the interior of the brain. It’s unclear at this point exactly when in the course of Alzheimer’s fibrin deposits become a factor and whether they are a primary cause of the disease or a consequence of other, earlier pathogenic mechanisms. What they are not, says Strickland, is a mere comorbidity, a separate condition that happens to accompany aging. 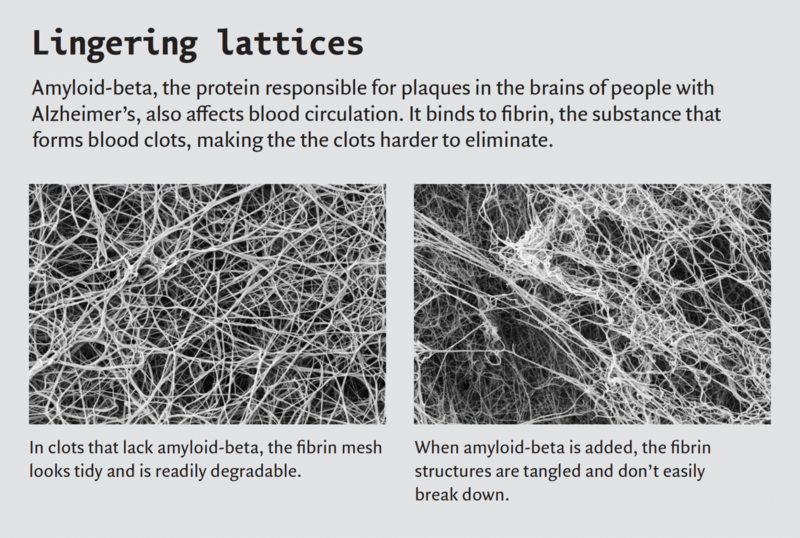 Leaking fibrinogen and fibrin clot formation contribute to Alzheimer’s, he says, by increasing neurovascular damage, neuroinflammation, and neuronal degeneration, as well as contributing to the deposit of amyloid-beta in and around blood vessels. That assertion is supported by a set of observations his lab made in mouse models of the disease—mice genetically engineered to develop Alzheimer’s. In those experiments, they found that fibrin deposits in the brain increased over time and correlated with the level of amyloid-beta plaques. Conversely, decreasing fibrinogen levels in the Alzheimer’s mice reduced neuronal death in the hippocampus. 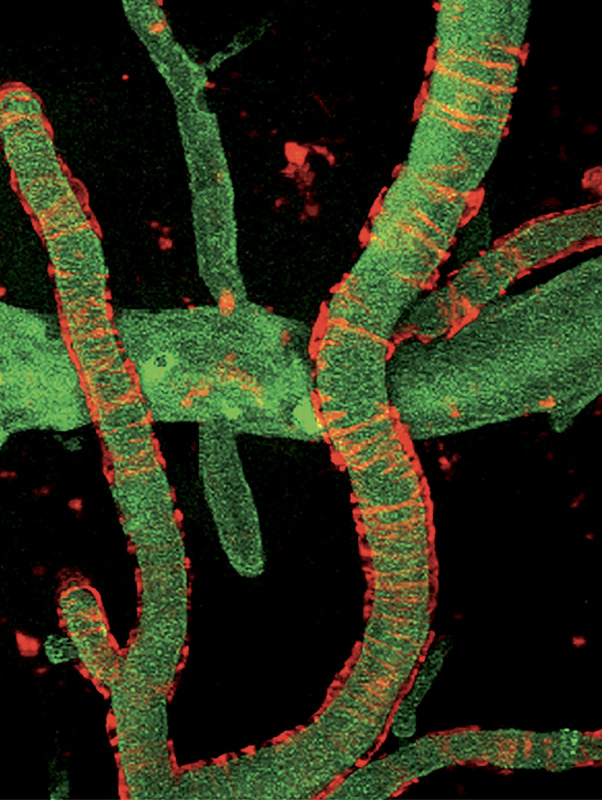 The mechanisms by which fibrin accelerates neuronal degeneration remain unknown, but the scientists have a few promising leads. Inflammation, commonly found in the brains of Alzheimer’s patients, is a likely contributor, and Strickland points to the interaction between fibrin and amyloid-beta in the brain as a major source of that inflammation. That interaction, which Strickland has analyzed in detail, is what slows the breakdown of blood clots, a process the body normally undertakes after a wound has healed, when the integrity of the blood vessel has been restored and the clot is no longer necessary. But amyloid-beta disrupts this natural system and prevents fibrin aggregates from dissolving normally. The result is an ever-increasing load of fibrin that may lead to chronic inflammation. While the protein’s pro-inflammatory function is normally beneficial—it is part of the body’s wound-healing process—the chronic inflammation that ensues when fibrin lingers in the brain can lead to cellular damage. 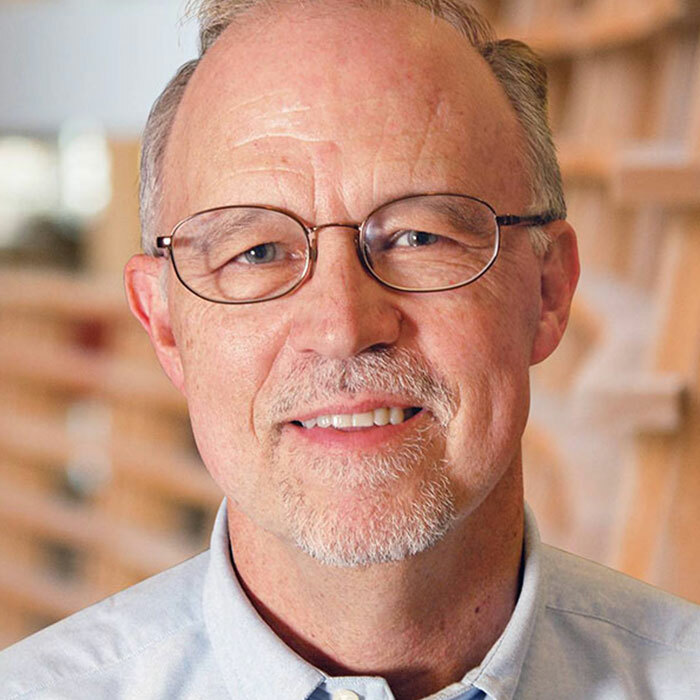 In Fillit’s view, one of the most important aspects of Strickland’s research is the way it establishes cerebrovascular abnormalities—including common aging disorders such as hypertension and atherosclerosis—as part of the pathology of Alzheimer’s. This way of understanding the disease expands the number of possible therapeutic targets and invigorates the search for new drugs. “Just as treating multiple disease mechanisms in cancer has improved outcomes, a similar evolution of therapy can be envisaged for Alzheimer’s,” Strickland says. He and his team are currently looking at antibodies that could inhibit the interaction of fibrinogen and amyloid-beta in the brain. Strickland’s research could also contribute to new methods for diagnosing Alzheimer’s sooner—such as testing patients experiencing cognitive impairment for vascular abnormalities and inflammation—and new ways to track its progression. Multiple studies already have shown that high levels of fibrinogen in plasma increase the risk of dementia, and the protein was recently established as a biomarker for Alzheimer’s. The disease has so far managed to resist all efforts to disrupt its lethal course, and Strickland may or may not find success where so many others have failed. Whatever happens, he has already succeeded at broadening the scope of Alzheimer’s research and changing the way we think about this maddeningly complex disease. That’s a breakthrough by any measure.